We finally have snow in Toronto! 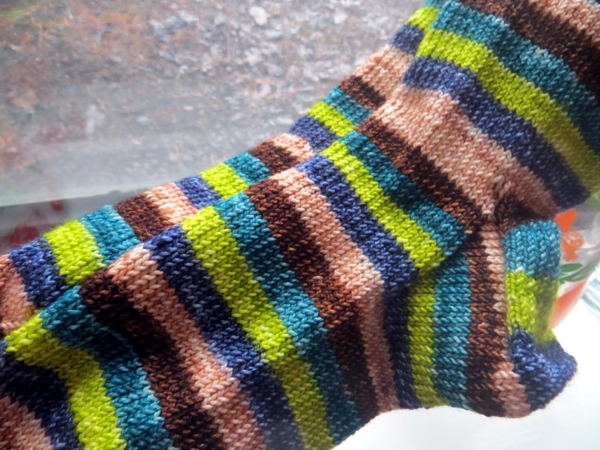 and I am finally finished the socks I started when snow was a far-off thought. Seriously though, not to have any accumulation of snow until the second week of January is not what you expect in this city. We are still seeing lots of tourists around our condo neighbourhood - I pass a youth hostel every day as well and often see young people there speaking all kinds of languages and demonstrating various approaches to one-bag travel - and I keep thinking, Are they disappointed? Or maybe they are relieved, because footwear is the worst to pack and you really need a variety of options for snow and icy cold not-snow. Fun fact: it was such a big deal when we finally got the white stuff, one of the churches near the condo played 'Let It Snow' during its afternoon bell-ringing concert. SO CUTE. I am often at home working during the day and it's actually quite nice to look out at snow as opposed to dirt. This morning the evergreens outside the living room window were frosted with it. And I so enjoy having a reason to wear my ultrawarm socks again. These socks are more of a spring/fall option, but they are one of my favourite stripe combinations. I had to buy it from the Vesper shop long after they were released in the club I'd joined, because my skein was lost in the mail! It's only happened to me twice in all my years of online yarn shopping and this is the only time I was devastated. I'm so glad I was able to get a skein in the end. 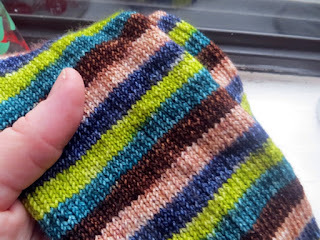 Funny how the stripe at the ankle wasn't interrupted by a few stitches in another colour, as usually happens after I go to two needles for the sock flap. I used to worry about things like that when I tried to wear shoes that showed off my socks - now I am grateful just to be comfortable, and to have beautiful stripes in my sock drawer to greet me in the mornings, and to touch soft wools when I am washing them and putting them away. 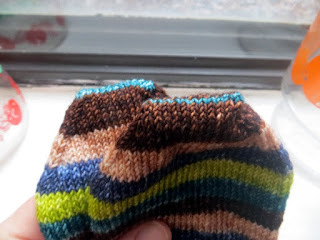 I am so glad I learned to knit such a practical everyday thing well enough to make it an everyday thing. Oh I do love these socks. But I also love checking things off my to-do list and they were on it for such a long time. Now I'd better go and do some other things that were held up for them. Take care and I hope you get some things done today too!